“But we have always done it that way.” How often have you heard that phrase at the university, especially about Information Technology Services (ITS)? Take a step back and think about it. My response to that statement might be – “The status quo is not good enough for a world class institution like U of T.” We have heard your voices too, loud and clear, and many of you are in agreement. Positive change, a new direction and clear strategic priorities are in order. Earlier this summer ITS launched the strategic planning process. 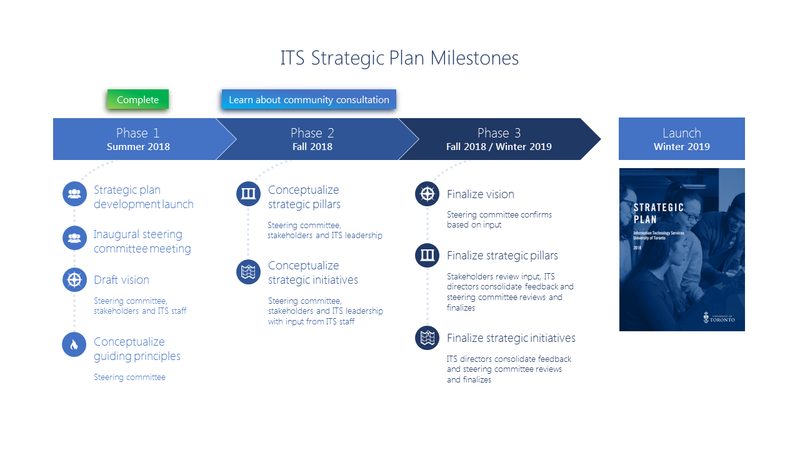 As a first step we engaged a few hundred people including students, staff and faculty and asked them what they envisioned for ITS and IT at U of T three years in the future. Vision development is one of the first steps in our process. This new plan will shape our work, highlight our priorities within ITS and IT at the university for years to come. Through feedback, discussions and expert advice and conversations with various committees, including a steering committee, the vision is being crafted and honed. Whenever I go into these processes of wide consultation I always am concerned about diverse opinions and our ability to consolidate them into something meaningful. A good colleague of mine always reminds me “trust the process”. Sure enough, in all the great feedback we have received there is a huge amount of commonality. You may ask what our vision for the future is. I will be launching it later this fall. So please stay tuned. Although, I can give you a preview now – it’s about people. Core to everything we do at ITS, is our people. People within our division and partners throughout the university community and beyond. Without them, our applications, systems and services would simply not exist. Our collaborative projects and solutions would not take flight. And we want to hear your feedback about the process so far and the vision once we share it. Visit our webpage often to keep up with the process and learn more about our community consultations and next steps. A respected IT veteran, Bo Wandschneider has spent 30 years in Higher Education Information Technology.